Americans might be used to buying Fair Trade chocolate and coffee, but bananas are an entirely different story. The Fair Trade banana industry began in Europe nearly two decades ago and while it currently represents 30 percent of the banana market in the United Kingdom and 50 percent of the market in Switzerland, less than one percent of the bananas sold in the U.S. are Fair Trade certified. Oke USA, the banana arm of the Fair Trade co-operative Equal Exchange, wants to change this fact. That’s why the company, which is partnering with the European co-operative AgroFair to source bananas directly from small farmer co-operatives in Ecuador and Peru, hosted the Equal Exchange Banana Conference recently at Tufts University. The event brought together stakeholders across the Fair Trade banana supply chain to consider what it would take to expand the industry while staying authentic to the core goals of Fair Trade. The mainstream banana industry is dominated by Dole, Chiquita, Del Monte, and Bonita, which together sell more than 80 percent of U.S. bananas. The majority of the profit stays with the retailers and the smallest percentage goes to the workers on plantations, where most bananas for export are grown. Notorious for decades for having some of the harshest working conditions in agriculture, conventional banana plantations still rank as some of the most difficult places to work, particularly in countries with less robust worker protections like Guatemala and Ecuador. Furthermore, most banana companies move production to whichever country has the lowest wages and least stringent worker protections, what is referred to as a “race to the bottom,” making it especially challenging to address worker exploitation. Dominated by large numbers of monocrop acres, these plantations also require heavy pesticide use, which has been shown to be damaging for both human and environmental health. Fabiola Ramon, a farmer and the president of Asociación de Pequeños Productores Bananeros “El Guabo,” an Ecuador-based cooperative of banana farmers, traveled to Boston to share her story at the conference. According to Equal Exchange, the El Guabo cooperative started in 1998 when 14 small-scale banana farmers in southwest Ecuador “decided to take the tremendous risk of sending one container (about 38,400 pounds) of bananas to Europe with the hope of selling it directly to a supermarket.” Today 350 small-scale farmers grow Fair Trade bananas on farms ranging from two-40 acres each and work in conjunction with AgroFair and Oke USA to export the fruit. In addition to earning a fair price for their bananas, the co-op receives an additional $1 per case (around 40 pounds of bananas) as a Fair Trade social premium. This may seem small, but since the co-op was founded in the mid-1990s, the premium has allowed it to support clinics in the town of El Guabo, provide health insurance for the farmers, and pay for the salaries of teachers and technology in schools. Lianne Zoeteweij, Managing Director of El Guabo, also pointed to the fact that the co-op is a part owner in AgroFair, demonstrating the critical role that cooperatives play throughout the supply chain. 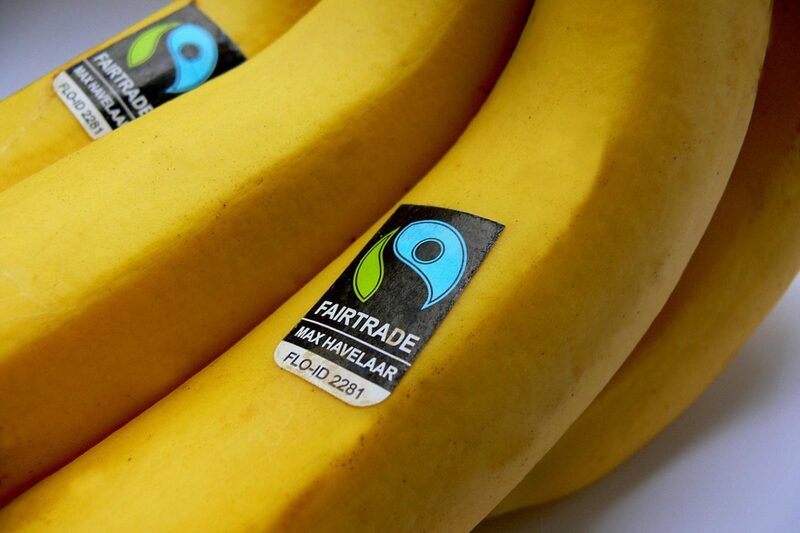 One of the challenges to Fair Trade is the fact that it is primarily seen as a labeling scheme. “The label is the beginning, not the end game,” said Jostein Solheim, CEO of Ben & Jerry’s, which sources all of its banana puree from El Guabo. “Although the label is an opportunity to give some power to the consumer, it doesn’t yield the ultimate solution for scaling up beyond the current niche,” said Solheim. The latter would ultimately require changes to the environmental and labor conditions of the major market players, rather than solely relying on consumers choosing a more expensive option. As Walmart’s best selling product, bananas are a major source of profit for most retailers, which yield a great deal of power over the market. Industry research indicates that consumers would pay significantly more for bananas than they do, as the fruit is still relatively inexpensive—and retailers have the power to set these prices. While Fair Trade bananas sourced from plantations are beginning to make inroads in major retailers in Europe, in the U.S., bananas like El Guabo’s mostly show up in small stores. Some cooperative grocers at the conference said they’d had mixed results marketing the fruit, particularly when they blend their profit margins with those for conventional bananas, a common practice which yields a Fair Trade consumer price that is only 15-25 cents higher per pound. Although some retailers experienced selling out immediately, others expressed trepidation about increasing prices without a more consistent and reliable supply chain. Perhaps one of the answers lies in the real distinction that cooperatives like El Guabo provide U.S. consumers—the opportunity to connect with the face of production, or the human side of the fruit. Zoeteweij recounted that earlier that week, the owner of a small apple orchard in Massachusetts had approached her, sharing her fears that the family apple business would end because her children didn’t want to take over the orchard. She saw telling their stories as key to saving the farm. Yet, in our attempts to improve American consumers’ relationships to local food, the stories of banana farmers may have gotten somewhat lost. “Our supply chain depends on each one of you here,” Nicole Vitello, President of Oke USA, told conference participants. And they left with the stories of Fabiola Ramon’s farm and community of El Guabo firmly in their minds. Though the co-op sells fewer bananas than when it started, it’s clear that the relationships developed through the direct supply chain have enabled them to continue producing bananas on their own land, leaving a future into which Ramon’s children are planning to step. Photo of bananas by Max Havelaar. Photo of Fabiola Ramon by Aliza Wasserman. I'm surprised that you didn't reference the ground-breaking documentary film "Bananas" in this article, or better yet "Big Boys Gone Bananas" by Fredrik Gertten. It documents the incredible corporate power of the United Fruit company and Dole in particular on this industry. A must watch: www.bigboysgonebananas. Thanks for the suggestions about marketing and the films. "Bananalands," the film, was shown as part of the conference to a very large crowd! Matthew- Whole Foods certainly does sell Fair Trade bananas. Do you know what sort of farms/plantations they are sourced from? And thanks for your question clarifying the retail profit on bananas. The Bananalink information cited (http://www.bananalink.org.uk/who-earns-what-from-field-to-supermarket) is for UK retailers, but UK consumer prices for bananas have gone down since 2010, so the amount of profit may have been reduced as well. The phenomenon you cite of decreasing retail prices for bananas is specific to the UK.